AP PGECET 2019, known as AP Pos Graduate Engineering Common Entrance Test-2019 (AP PGECET 2019) is conducted from 10thMay to 12th May 2019 by Andhra University, Visakhapatnam on behalf of Andhra Pradesh State Council of Higher Education (APSCHE) for admission into M.E., M.Tech and M.Pharmacy courses for the academic year 2019-19. Andhra University, Visakhapatnam going to release the result of AP PGECET 2019 on May 17th, 2019. Candidates can download AP PGECET 2019 result along with the rank card in online mode in official website and Manabadi.co.in. With the declaration of the result, candidates who meet the minimum qualification marks criteria will be then shortlisted on the basis of merit list. PGECET-2019 is the Andhra Pradesh Education Common Entrance Test for admission into M.E./M.Tech./M.Pharm. courses in University Engineering / Pharmacy colleges and their affiliated colleges approved by All India Council for Technical Education for the academic year 2019-19. These tests are being conducted by Andhra University,Visakhapatnam on behalf of Andhra Pradesh State Council of Higher Education. The candidates, who were applied for this entrance test, they were attended the entrance exam 10th may to 12th may and they are waiting for their results for join into Post Graduation courses. The results of AP PGECET will be uploaded at web portal by the Department AU. AP PGECET exams 2019 Results to be declared on 17th May at https://sche.ap.gov.in/PGECET. Candidates who have appeared for the exam on May 10th and may 12th, 2019 can check the results from the official website and Manabadi.co.in website. 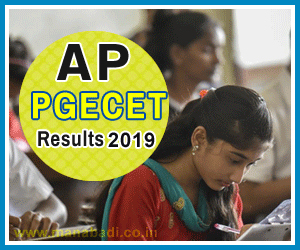 Browse for "AP PGECET Results 2019" Link. Your AP PGECET results are displayed. The qualifying percentage marks for obtaining a rank in APPGECET -2019 is 25% i.e., 30 marks out of a total of 120. However, in the case of SC/ST candidates, there shall be no minimum qualifying marks for ranking the candidates. The rank obtained with the benefit of relaxation of the minimum qualifying marks at the APPGECET-2019 by any candidate claiming to belong to SC/ST category will be cancelled in case the claim is found to be invalid at the time of admission. Candidates who are looking for the Andhra Pradesh PGECET Web Counselling need to carry the mentioned documents in the official notification. Search rank wise counselling dates & helpline centre. Attend the AP Engg Entrance Test Counselling at mentioned date & time. Certificates verification process in done by Officials. Pay the AP PGECET Web Counselling Application fee and take fee receipt. The fee receipt is having the Registration number and password. By using these credentials, you have to enter into the Andhra Pradesh Engg Entrance Test Web Counselling. Check rank wise colleges list available in the web option list. Choose require colleges among the list and click on submit. Keep AP PGECET fee receipt for future purposes. While filling up the seats in colleges, first preference will be given to candidates qualified in GATE / GPAT in the relevant based on their test scores and the remaining seats with the candidates qualified in APPGECET-2019 as per their merit ranks.